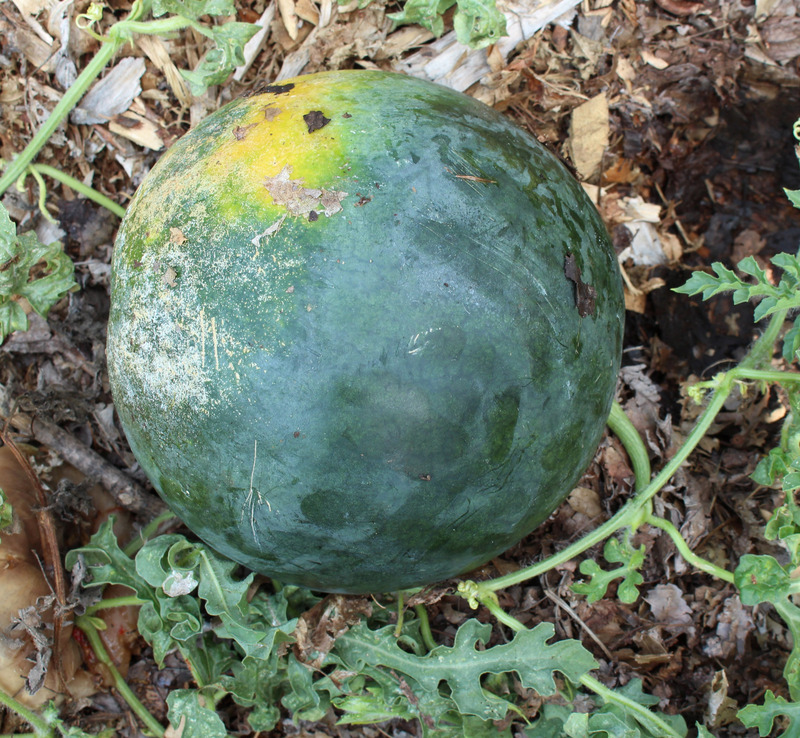 Given sun, heat, and reasonably moist, fertile soil, watermelons are easy to grow. The greater challenge is in harvesting them at their peak of perfection. Even professionals sometimes fall short, as witnessed by not-quite-ripe watermelons I “harvested” awhile ago from a supermarket shelf and, a couple of weeks later, from a table at a local farmers’ market. That was while I was waiting for my own watermelons to ripen — the delectable variety Blacktail Mountain. But should I have been waiting? All sorts of indicators are touted for telling when a watermelon is ripe. The part of the melon laying on the ground supposedly turns yellow. The tendril opposite where the melon in question is attached dries up. Or my favorite method: thumping. Knock you knuckles on your forehead, your chest, and your stomach. The sound of a ripe watermelon should match the sound of the chest thump. The forehead sound indicates that the melon is underripe; the stomach thump, overripe. Sure, one could pull out the bells and whistles. As I wrote, even professionals have problems determining watermelon ripeness. To aid in commercial harvesting, nuclear magnetic resonance, one possibility, was considered — at $60,000 to $1,000,000 — out of budget. Acoustic resonance testing ($950) was a more viable alternative, but still not for me, with my five plants. After my two disappointing purchases, my mouth was watering for my own melons. I ignored the question mark hovering in air above the largest of the lot and, despite its lack of a dried tendril, a yellow bottom, or a telltale thump, cut it from the plant. Long story short: It was delicious, perhaps just a tad overripe. What about the other waiting melons? I’m just going to harvest them, as needed, and hope for the best. Update: I may have one more addition to the imperfect list of watermelon ripeness indicators. It seems that ripe melons might develop a whitish, waxy “bloom” on their skins. Update on the update: Scrap that way bloom indicator. Or, it might be part of the picture. Now I look for a number of indicators, and if some indicate ripeness — I thump the melon before picking. Part of the watermelon problem is that I don’t grow enough watermelons. I once lived and gardened in southern Delaware, a few miles from one of the epicenters of watermelon production. With ideal climate and soil (sandy), I grew an abundance of large watermelons. Whether or not a single melon was picked underripe was not so critical. Once ripening began, any unripe ones could be relegated to the compost pile; a better one was always in the offing. Like watermelons, sweet corn is also easy to grow. It can get by with less heat than watermelon, but demands a more fertile soil. Harvesting sweet corn at its peak of perfection also can be a challenge, though not nearly the challenge of watermelon. Picked too soon, corn is tasteless and toothless; picked too late, and it’s too starchy and toothy, a delight for animals, excepting humans. The first hint as to when I get to pick corn is when tassels atop the stalks begin to shed pollen grains — millions per tassel! Any doubt about ripeness, and it can be confirmed before committing to harvest by peeling back the husk just enough to see some kernels. Their color and plumpness might be a giveaway. If not, a thumbnail pressed into a kernel should yield a milky fluid. Sweet corn, in contrast to watermelon, is easy to produce in quantity, even in a relatively small garden. So tasting an ear is no great sacrifice; there’s plenty more. Hybrid varieties of corn tend to ripen uniformly, so once one ear in a bed is ripe, the whole bed is likely also ready for harvest. A bed of a non-hybrid variety requires more frequent assessment and harvesting, which is better for home use where you might want a few ears each day or so, rather than a once-over harvest. With successive planting and selective harvesting, we’ve been enjoying sweet corn almost daily since the end of July. This entry was posted in Fruit, Gardening, Planning, Vegetables and tagged sweet corn, testing for ripeness, watermelon. Bookmark the permalink. Trackbacks are closed, but you can post a comment. My watermelons failed to thrive this year in Michigan. I never grew them before. None fruited or even grew that much. I had musk melons galore, but the watermelons just kind of sat there. Not sure what i did wrong? I will try again next year. Frustrating as I talked to a friend in upper Michigan in zone 5 that had watermelons. Orangeglo was the fav of most of the growers I know.